If you are planning a large wedding, you will need a sound system so that everyone can hear over the outdoor sounds. If you want music, you will need power. Extension cables are suitable if there is a close power outlet, but check the safety first. Otherwise you may be reliant on battery power. You may look at the weather forecast and breathe a sigh of relief when it is due to be sunny. Beware and check the days before also. While the sun may shine on the big day, you and the guests may have mud underfoot if there has been days of rain previously. You will need to think about cleaning the site after your ceremony. You may want to hire a skip to make the job quicker. Try looking at the comparison site Skip and Bin for the best quotes in your region. While a remote beach or forest may be your ultimate romantic location, consider how guests would get there. If parking is at a distance, you may need to provide a shuttle service using an appropriate vehicle. 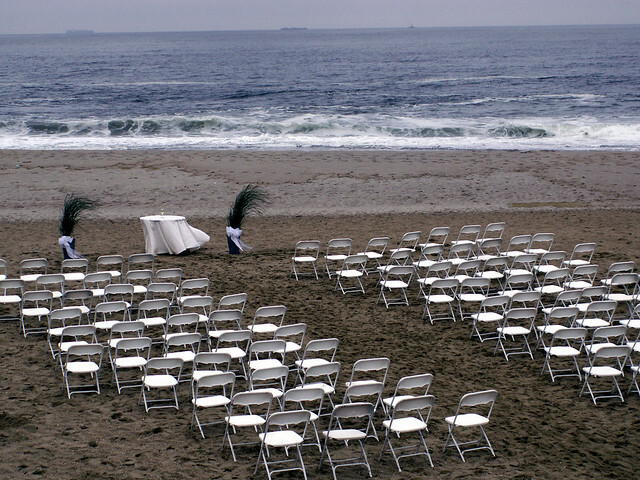 Weather is only one of many things that can make an outdoor wedding out of the question on the actual day. Have a backup plan in place which can still meet your wedding dreams. Make sure the fabric of your dress is heavy enough to withstand gusts of wind. Likewise your hair should be carefully styled to make sure it is firmly in place. Think carefully about your menu. Chilled dishes outdoors are not suitable on hot days. Provide plenty of refreshing non-aloholic drinks especially on a hot day. You cannot force the sun to shine in a certain direction at a certain time. Visit your planned site a few times before the ceremony. Try and visualise the position of the sun. Is it going to be shining in your eyes, or the eyes of your guests? Plan the time of your ceremony and the orientation of the location so that the sun is at the backs of the guests. If your celebrations are planned to continue after dark, you need to think about lighting. You may be able to combine lighting with flying insect control in the form of citronella burners or similar. Outdoor weddings can be wonderful. With good planning you can relax and enjoy your big day! Written by Susana Rowles from Simply Wedding Photography, a wedding photographer based in Brighton, England.